The Royal College of Chiropractors (RCC) is an organisation for chiropractors in the UK who are dedicated to furthering their education and seek to provide the best clinical care for their clients. Dr Jonathan Wilson (Doctor of Chiropractic & Fellow of the Royal College of Chiropractors) is a fellow of the Royal College of Chiropractors which is the highest level of membership. 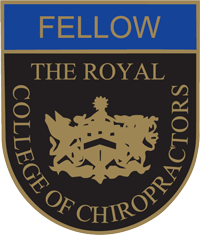 Fellows of the Royal College of Chiropractors have to demonstrate that they are experienced and have completed study in the field of chiropractic that is equivalent to a university approved MSc programme (180 M-level credits). This award seeks to recognise a dedication to improving the profession with a clear focus on self-improvement aimed at providing the very best chiropractic care. Dr Wilson (Doctor of Chiropractic) has focused his study on evidence based care for chiropractors, looking at ways of measuring improvement in clients as they heal to bring certainty to them that they are getting the results they want. The British Chiropractic Association (BCA) is the largest and longest established association for chiropractors in the UK. Dr Wilson (Doctor of Chiropractic) has been an active member of the BCA since graduating many years ago. The BCA is a support organisation which seeks to maintain a high standard of practice for chiropractors who are members. The BCA ensures that its members continue with a high level of ongoing education and requires members to maintain a high standard of personal and profession ethics. The BCA is the premier organisation for chiropractors in the UK and is often seen as the ‘Public Voice’ of chiropractic. As the General Chiropractic Council sees itself as a regulatory body rather than a promotional body, the BCA has undertaken the role of promoting the profession and its members to the public. To ensure that those persons who practice chiropractic in the United Kingdom are registered with the GCC. To ensure that registered Chiropractors have been highly trained at a recognised educational institution and are fit and competent to practice. To ensure that Chiropractors who are registered maintain ongoing education, professional insurance and professional accountability. To ensure that chiropractors adhere to a professional code of conduction (code of ethics) as set down by the GCC. The GCC has a board of professionals who manage and direct the council. The board is made up of lay members, other professionals of good standing, from a variety of professions, and representative chiropractors. This balance is to ensure that the chiropractic profession operates to current professional standards that are in keeping with other professions in the United Kingdom, and to ensure that an objective perspective is given to the behaviour and conduct of the profession and individuals in the profession. Dr Wilson (Doctor of Chiropractic) is registered with the GCC, and is in good standing with the GCC and has been so continuously since its initiation.